(SACRAMENTO) — Using catheter-based ablation instead of medications alone reduces the risks of death and stroke in patients with the common form of heart arrhythmia known as atrial fibrillation, or AFib, new research from UC Davis physicians shows. Ablation is currently only recommended when AFib medications don't work or aren't well tolerated. 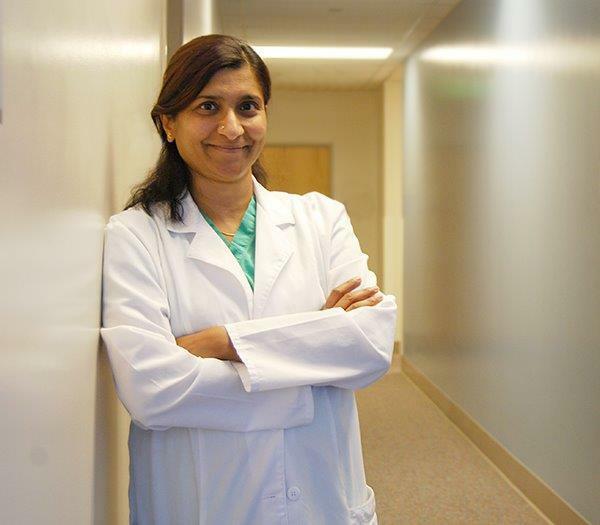 "Less than 2 percent of patients undergo ablation early in the course of AFib when the procedure can be most beneficial," said lead author Uma Srivatsa, professor of cardiovascular medicine at UC Davis Health. "Our study shows that ablation may be considered as a primary treatment for everyone with the condition." Part of the hesitation to use ablation earlier and more often could be because comparative outcomes research so far has produced inconsistent results. Most of those studies focused on single centers or were controversial in terms of patient selection and cross over, according to Srivatsa. The new study, published in the journal Circulation: Arrhythmia and Electrophysiology, addresses those limitations by evaluating AFib treatment outcomes over a long period of time and for large numbers of multi-ethnic patients with similar health statuses. "It's only with more robust, real-world studies like ours that we'll be able to develop a clear picture of what works best in addressing clinical outcomes for AFib patients," Srivatsa said. It's estimated that at least 2.7 million Americans have AFib, which is diagnosed when the heart beats inconsistently due to uncoordinated signals between its upper chambers. The condition can cause lightheadedness, fatigue, shortness of breath and chest pain, and is associated with increased risks of stroke and death. Medications can help reduce AFib symptoms and risks by controlling heart rate and rhythm and reducing blood clots. Ablation is a more long-term solution that involves using heat or extreme cold to destroy the heart tissue responsible for the faulty electrical signals, reducing the need for rhythm-control medications. In conducting the study, Srivatsa and her colleagues evaluated medical records from the California Office of Statewide Health Planning and Development for AFib patients hospitalized between 2005 and 2013. Two groups of about 4,000 each were compared: one that was treated with ablation and another that was not. The groups were matched in terms of AFib patterns and prior hospitalizations. The study confirms the overall short- and long-term safety of ablation as an AFib treatment, according to Srivatsa. "Our data supports wider utilization of ablation along with improving the awareness of its benefits," she said. In an editorial published with the study, cardiologists from the University of Toronto wrote that, while retrospective studies have some limits, Srivatsa and her colleagues have highlighted a significant area for additional research. Together with randomized trials, they said, the UC Davis work will help "confirm or refute whether or not [AFib] ablation is truly a life or death situation." The study, titled "CAABL-AF (California Study of Ablation for Atrial Fibrillation): Mortality and Stroke, 2005-2013," was funded by Shalu and Hersh Saluja. Additional authors were Beate Danielsen, Ezra Amsterdam, Nayereh Pezeshkian, Yingbo Yang, Eric Nordsieck, Dali Fan, Nipavan Chiamvimonvat and Richard White, all of UC Davis Health. UC Davis Health is a leading Northern California center for treating AFib and other complex cardiovascular conditions. More information is available online.